John F. Doran, age 86, of Miles City. On the 26th of March 2019, Jack passed away early in the morning, at his new home in the valley, after struggling several months with heart issues and dementia. Jack was 86 years old. He was born in Miles City, Montana to John and Frances Doran, of Crow Rock Route. He was their fourth child and was the only boy amidst 4 sisters. He always said he never fought with his brothers. After graduating from 8th grade, he went to work full-time with his father on the farm and ranch that his dad homesteaded. Jack loved this land and loved to talk about its’ history and all who came before him. Jack had a great sense of humor, he loved playing cards, going to rodeos and country dances. He also was very musical and could play the piano and guitar and a few other instruments by ear. In 1952, he met the love of his life, Clare Wyttenhove, who was teaching at the Hartwick school. They married August 23, 1952 and enjoyed 66 years together. Jack and his wife raised 7 kids, that married wonderful spouses who gave them 20 grandchildren and 10 great grandchildren. Jack was very proud of raising hereford cattle and won many awards. In later years he switched over to angus cattle. He also raised alfalfa seed, wheat, oats and barley through the years. Jack was a lifetime member of the Catholic Church and was involved in the Cursillo. 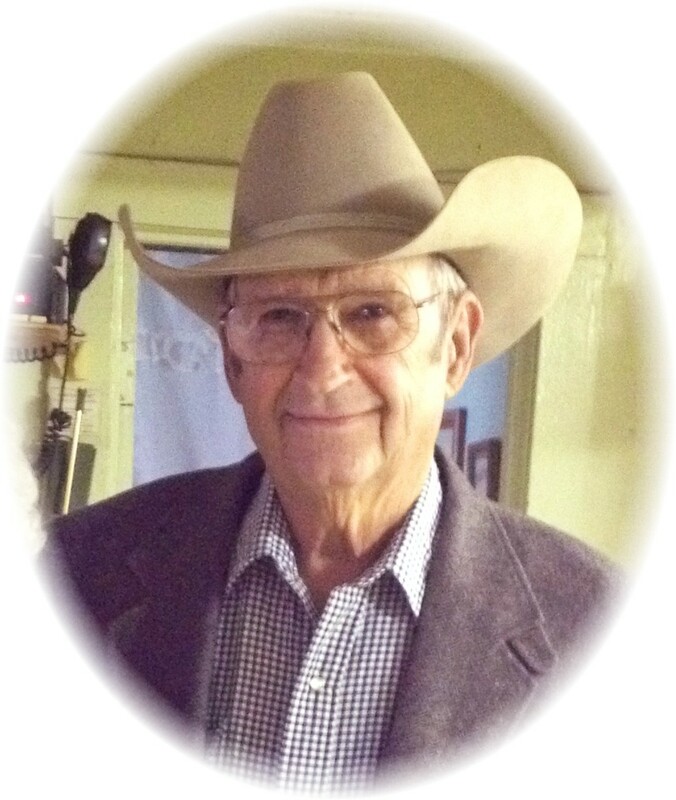 He was a school board chairman and member for many years for the Twin Buttes School, and belonged to the Eagles and Knights of Columbus as well as the Range Riders. He loved Clare, his kids, and grandkids. The country music channel was a regular on the TV, and Jack would frequently whisk his bride off her feet and dance a few rounds. He often graced her with fresh wild flowers in the spring. He loved a good meal of meat and potatoes and gravy, with a juicy steak being his favorite, followed up by an apple pie. He loved to hunt; even being the “guide” for his kids and grandkids in later years. He also loved to fish, but especially liked to eat fish. He loved ranching and his girls (the cows) and every part of being a country boy! He believed in working hard and leaving the rest up to the “good Lord”. No matter how much work was yet to be done; Sundays were a day of rest. He always had a smile and wave for everyone and enjoyed chatting. He never knew a stranger! Jack was preceded in death by his parents, John and Frances Doran, his sisters Evelyn Rautio and Ruth Roos, and his granddaughter Jenny Martin and great granddaughter Hayley Martin, as well as his mother and father-in-law Harriet and Ernie Wyttenhove. Jack is survived by his beloved wife, Clare, his children Dan (Jean) Doran, Jerry (Linda) Doran, Cheryl (Steve) Harris, Suzanne (Bruce) Brown, Kathryn (Greg) Pagans, Joe (Andrea) Doran, Will (Dawn) Doran and 19 grandchildren, 9 great grandchildren and his two sisters Ann Bird and Dorothy Doran. The family wants to thank the doctors and nurses who cared for him at the Holy Rosary Hospital during his illness, as well as the Hospice staff and all those who helped in the last weeks. Any memorials can be given to a charity of your choice. Family will receive friends on Friday, March 29, 2018 from 4-6 p.m. with a 6:00 p.m. Rosary/Vigil at Stevenson and Sons Funeral Home in Miles City. Mass of Christian Burial will be Saturday, March 30, 2019 at 11:00 a.m. at Sacred Heart Catholic Church in Miles City. Rite of Committal will follow In the Calvary Cemetery. Condolences to the family may be sent by visiting www.stevensonandsons.com. I am definitely going to miss my Dad. Jack was my first role model. Fond memories of the times I was fortunate to share with the family. I’m going to miss him too. Dad was a great role model. He loved mom for 66 years and he had the greatest work ethic of anyone I ever knew. I love you dad. Talk to you later. Prayers to all of the Doran families! You all have been great inspiration to me and friends over the years. The simple memories of having you me out at your house during branding on Memorial Day weekends. I still treasure those memories today. Love and prayers to all of you! Hugs to all my Doran cousins and their families. He was a special person and I have many memories from my youth out at the ranch. Some firsts too. My first whiskey and honey because I had a bad cold and the grownups were going to the dance at the school. My first time shooting a guns. My first from scratch angel food cakes. It fell out of the pan. Blessings, peace and love to you all. Dorothy, Claire and family, I am so very sorry for your loss. God bless you and give you peace & comfort. RIP, John…I didn’t know you, but I know you son, Joe. Nothing more needs to be said. Such a great man, my thoughts & prayers are with the family. I did not know Jack very well but just in listening to Kathy talk about him all the time I knew that he was my kind of man. Hard-working family man. Kathy and the rest of your brothers and sisters and mom, you have my sincere condolences and I know from what you said and what I’ve heard about him he is now with the Lord resting in peace. It is a very hard thing to go through but just focus on all the wonderful memories and know that he will be in your heart forever The hurt will never go away but it does dim with time. I love y’all. May you find peace and comfort in the many memories…blessings to you all as you grieve this tremendous loss. Doran Family. May God give you all comfort with your wonderful memories. God Bless you all! Sorry to hear of John’s passing. We will have a mass said for him here in Forsyth. Always enjoyed our visits with him throughout the years. I’m so sorry for your families loss. Prayers and condolences to you all. Jack was a great man and a pleasure to know him. My sympathies to his family. Our thoughts and prayers go to all of the Doran family. May your husband, father and grandfather rest in peace. We hope that all of your memories help you all through this difficult time. Linda and RIchard Meidinger. He had to be a wnderful father to have raised such a wonderful daughter in you Cheryl. My heart feels for you in this earthly loss. Our Dads are truly special. The first one to look into our eyes. Our first heros. You are in my prayers. Love and cherish those good memories. So very sorry for your loss. God’s blessings to all the Doran family during this difficult time. My prayers go out to you for peace and comfort. I’ve had some wonderful memories with you all. You showed me true love. God bless you. Condolences to the Doran family. We school kids were so excited to find our teacher, Clare, had found the love of her life while teaching at Hartwick School. And through the years, while I live far away, I have kept up on the news. Jack was a fine choice, Clare, and 66 years proves that. My prayers go with you. Thinking of all of you. Jack was a good guy raised a good family and cattle. Suzanne, so sorry to hear about you losing your dad. I will keep you and your family in my prayers and ask that the Lord comfort as only he can. I have such fond memories of Jack and spending time on the ranch as I was growing up. Both Clare and he always made us feel welcome and part of the family. I remember being allowed to ride in the back of the pickup on deer hunting expeditions, memories of Jack helping me find arrowheads, and memories of going to a dance at the old country school with my soon to be husband. So many more memories of being a part of this wonderful family. I’ll see you in Heaven, Jack! Clare and family—my deepest sympathy to all of you. He was a man of great faith. He never missed Mass—even driving in from Crow Rock. Enjoy the find memories you have of him. Doran Family, thinking of all of you during this time. I wil cherish the family sense of humor, fond memories with everyone. Prayers and hugs! Jerry, and family – We are with you in spirit as you say good-bye to your dad. So sorry to hear of your sweet dad. He was always so nice to me. My prayers. Will, Dawn and family, sorry for your loss. What a great guy. My heartfelt sorrow and comfort to Will, his family and friends. It is very hard to lose Dad. May God comfort you during this hard time. Sorry to hear of your dads passing. Just read about it today. He always acknowledged us in passing. May God be with all of you in the times ahead. Dear Clare- I am so sorry for your loss. Prayers for you and your family.